Wow, my readers are the BEST! I published last night’s post about my reaction to Black Swan with a lot of apprehension, but you guys left the sweetest comments. Not to mention, I got a couple emails from people said they had similar reactions. You know, every time I have a post that I think about deleting or never publishing, I remember those comments and emails and am reminded that it’s more often worth it to put yourself out there. Thank you. I did want to add a couple notes to anyone who’s going to watch Black Swan. I highly recommend seeing this movie with anyone you wouldn’t mind sitting next to when there are very sexual scenes going on. Also, I’m not sure this movie is so much the tear-jerker that others are. I sat through most of the movie pretty stunned and left the theater that way. It wasn’t until after I left that I think things sunk in and the waterworks started. But maybe bring tissues just in case. Also, for the squeamish…there may be some scenes where you have to cover your eyes. Just sayin. Not sure if those tips help or whatever, but the first one is definitely important! I can’t imagine seeing that movie with my parents! I had a fried egg over cous cous. 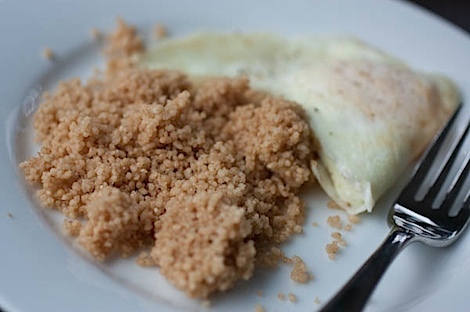 Yes, cous cous for breakfast = awesome. 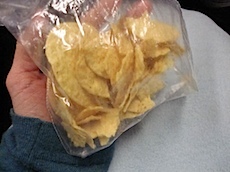 I realized this morning that I worked so hard ensuring I had dinner covered last night (and have been too busy to go to the grocery store), that I forgot to make sure I had something for lunch. I pulled together a few things, but knowing I’d be low on protein, an egg seemed like a good breakfast choice. I basically grazed on food all day. 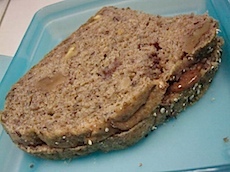 First – a homemade almond butter and strawberry jam sandwich with chia seeds on Great Harvest flax oat bran with some tortilla chips. 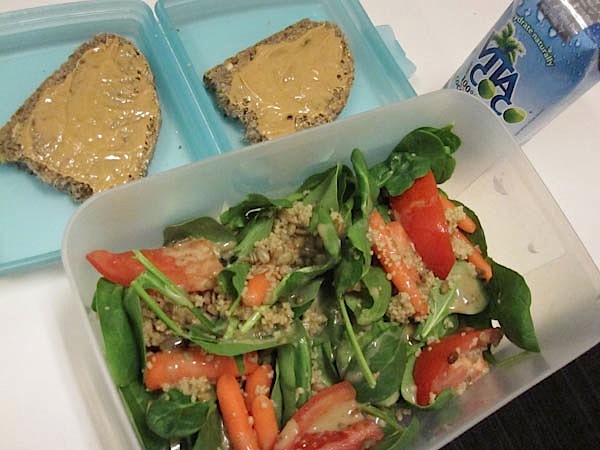 Later – I had PB FOB toast with a big salad (baby spinach, baby carrots, tomatoes, cous cous, and sunflower seeds with Sesame Goddess dressing). I subbed a Zumba class after work today. The class was HUGE! I guess people are really showing up in class for their fitness resolutions. That or they just missed us over the holidays. hehe. I had so much fun teaching and a fab playlist to boot. My favorite songs tonight were: Mira (the merengue I choreographed! ), Alright, Valio la Pena (Salsa version), and Moscas en la Casa (a cool down song I learned about from The Fitnessista when she used it at the Zumba class we taught at HLS!). I hit up Trader Joe’s on the way home (more on that in a bit). 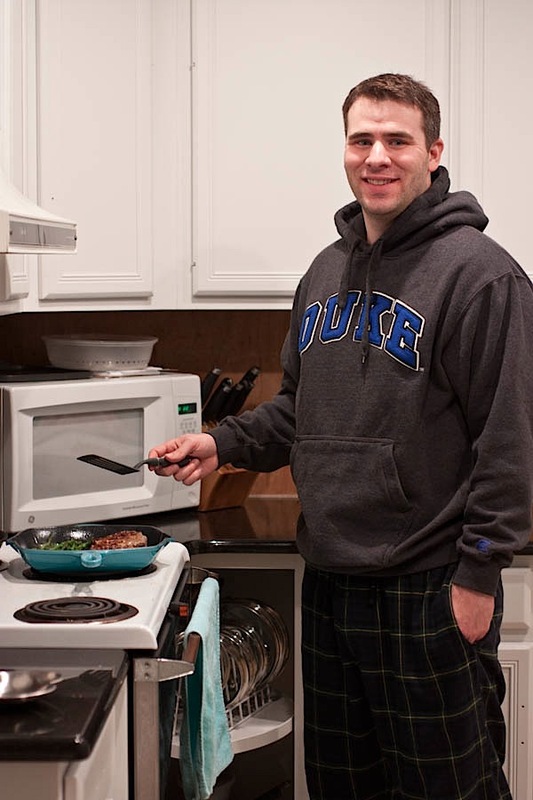 Once home, it was time to cook dinner. Ok, hubby cooked it. He bought some pre-made burgers with cheese from Earthfare and asparagus. We also had some Cascadian Farms potato wedges we seasoned with some random dry spices (salt, pepper, garlic powder, chili powder, paprika) and baked away. All together now. Dinner was quite enjoyable. We basically had pub fare at home – cheaper, faster, and in a more comfortable environment. 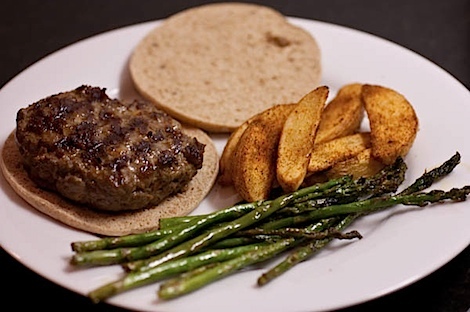 I must admit I wasn’t sure how I’d like the pre-formed burgers from Earthfare, but they were actually really, really good! Hubby – get these any time! 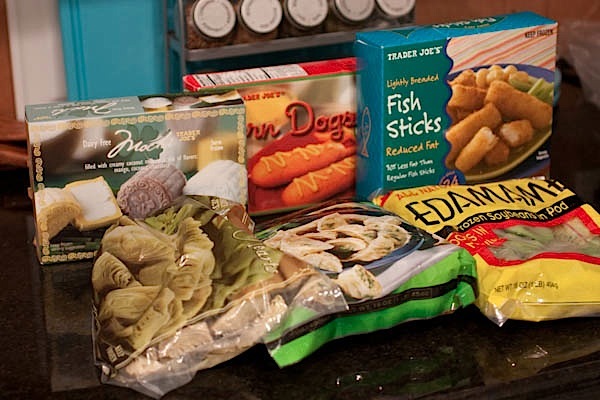 Frozen foods: fish sticks (because I’m getting tired of those halibut filets), corn soy dogs, artichoke hearts, vegetable gyoza, edamame, and mochi. Sure fish sticks and corn dogs aren’t really healthy, but I still think they’re a better choice over fast food or (most) greasy take-out. Sometimes, it’s about choosing the better choice…not the perfect one. Anywho, I do love frozen veggies. I’m hoping to do something cool with the artichoke hearts. Also, I have a slight obsession with mochi (thank you Japanese restaurant waitressing gig from college…lol) in all forms. 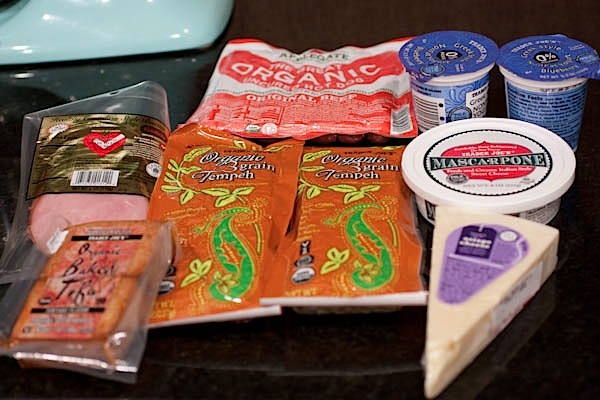 Refrigerated foods: Canadian bacon, tempeh, marinated tofu (because actually marinating tofu is easy but slow), mascarpone cheese, and asiago cheese. I’m hoping these will make some great meals soon. Canned foods: Cuban style black beans (because I love Cuban food and these will be easier than trying to flavor black beans – sometimes you want to be lazy), pinto beans, kidney beans, and coconut milk. 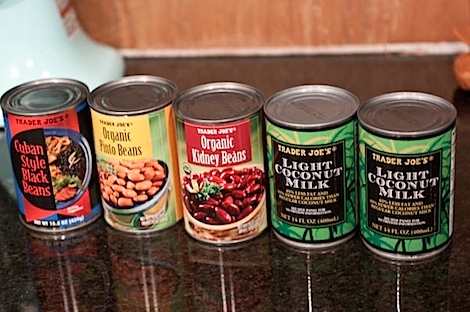 I love using the beans in quick soups and the coconut milk in oatmeal and smoothies (and hot chocolate!). 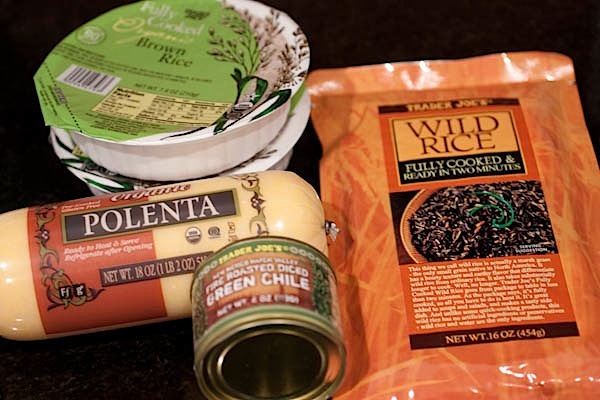 Grains/starches: polenta (very versatile and a nice change up from the usual rice/bread), wild rice, brown rice (for when you want brown rice, but you need it fast), green chile (how’d this get in this group? lol). Fresh: English cucumber (for salads), peeled garlic (because I’ve been wanting to make 40 cloves of garlic chicken for forever! 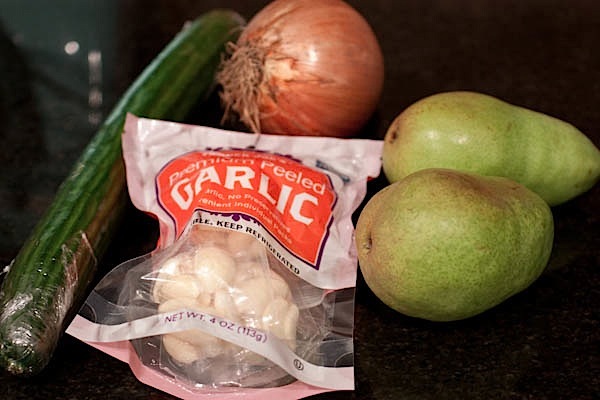 ), onion (for soup or something), pears (because pears are awesome). 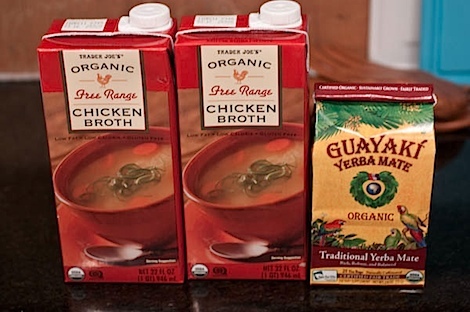 I also got chicken broth to make soup, sauces, etc, and Yerba Mate tea because I adore it. I love Yerba Mate for when you think you need a second cup of coffee but want something a little lighter. Be sure to check out my post about stocking a pantry for Eat In Month. What have you been stocking in your pantry lately? Any interesting finds? Where in Texas are you? I grew up there and while there aren’t any Trader Joe’s…We had the BEST Whole Foods! Austin. We definitely have awesome Whole Paychecks, but I think if we had a TJ’s I’d shop there more! And your reaction to Black Swan….I just read what you wrote and I think your honesty is beautiful! My quick eat in staples: Eggs, frozen veggies, lunch meat, canned beans, ect… A quick meal can be 100% healthy. I love what you said-“Sometimes it’s about making the better choice-not the perfect one”. I think that is so spot on! No one can be perfect in their eating habits all the time. That’s crazy, your TJ’s Mochi looks COMPLETELY different from the one I’m used to from TJ’s! So strange. We always have onion and garlic on hand. ALWAYS. Always eggs, some kind of bean, and a least a little milk. I’m starting to always have goat cheese on hand too! Yum. I feel like TJ’s frequently updates their products. I wonder if they’ll bring back the one you’re used to? ahhh now you have me craving trader joe’s! too bad the closest one is an hr away! Whenever I make brown rice, I always make extra and freeze it for later. 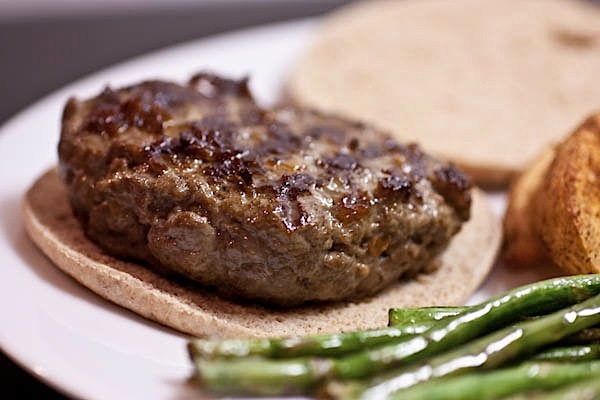 You can just pull it straight from the freezer and microwave it and it’s so good! 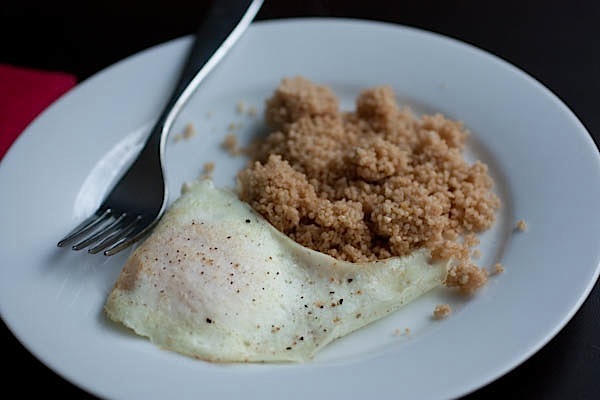 Cous cous with an egg sounds yummy! And I love those TJ’s corn dogs… they’re perfect with homemade sweet potato fries! I have to get to the store like NOW. and I LOVE that grill pan…so stinking perfect! I have that same Le Creuset pan and love it, but I am yet to figure out how to clean it with ease. 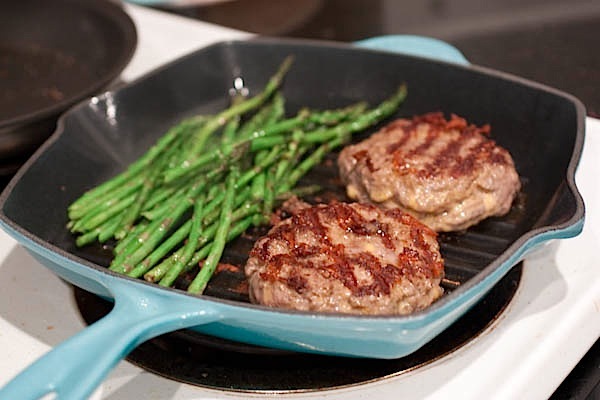 It is the perfect pan for the nights when you can’t grill outside. It was definitely a rich, thought-provoking and intense movie. After seeing it once, I want to see it again because there is so much to deconstruct! I also went alone (I love going to movies by myself) but I agree, there were moments where I wanted to share a reaction WITH someone. I think this is definitely a re-see (probably when it comes out on DVD) because there is so much to reconsider. Oh yea – I totally want to buy this when it comes out on DVD. 🙂 I can’t wait to see it again! I love pantry/grocery shopping posts! What does that say about me?? We had an Eat in Month FAIL ,yesterday. I got home from work and noticed the lunch I had left for the husband and kindergartener was still in the refrigerator. He casually mentions they had leftovers. After probing deeper with my 5 yr old they went out for Mexican food. It took a while for her to get up the goods on the real situation. Seriously…Seriously?!? That is so funny! I can totally picture a conversation going down like this at home. My husband is “supportive” but not necessarily “participating”. I’m not sure what he has done for lunch and I KNOW he has been getting coffee out. I’m allotting one “flex” meal a week and tomorrow’s dinner will be it! Anyone else doing a personalized version of the challenge? I keep “emergency soup” in my desk at work too! I always try to pick the ones with pull-tab tops. A gyoza is like a dumpling. Tasty!